MEYERS, Jan, a Representative from Kansas; born in Lincoln, Nebr., July 20, 1928; attended public schools in Superior, Nebr., and William Woods College, Fulton, Mo. ; B.A., University of Nebraska, Lincoln, 1951; advertising and public relations assistant for radio station in Omaha and a department store in Lincoln, Nebr., 1951-1954; city councilwoman in Overland Park, Kans., 1967-1972; city council, 1970-1972; Kansas senate, 1972-1984; elected as a Republican to the Ninety-ninth and to the five succeeding Congresses (January 3, 1985-January 3, 1997); chairman, Committee on Small Business (One Hundred Fourth Congress); was not a candidate for reelection to the One Hundred Fifth Congress. 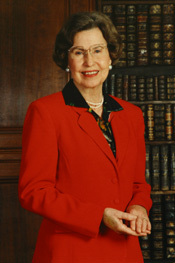 Jan L. Meyers in Women in Congress, 1917-2006. Prepared under the direction of the Committee on House Administration by the Office of History & Preservation, U. S. House of Representatives. Washington: Government Printing Office, 2006.